Have you ever run into a situation where you are using your computer as usual, open the Windows Explorer and are stunned to see your hard drives indicating they are “Almost Full”? Where did all the space go? As you keep on using the computer, a lot of stuff seems to build up on the computer hard drives. As you see in the image I maintain incremental backups for my OS in the D drive so it fills up with every backup run , and the other drive is dedicated to media and new software downloads, which tends to build up with time. As you can see, the folders stacked by size help you segregate data by their size and thus help you in organizing files. However using this approach you don’t get a complete overview of the contents of the drive. You still need to dig deeper into each folder. As the name of the software suggests, WinDirStat, provides us with information (stats) about the contents of a data drive, may it be a hard drive or a portable one. 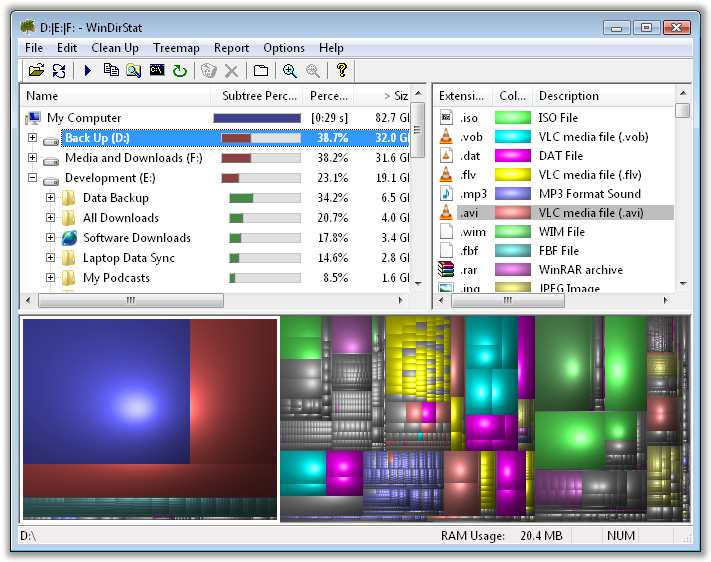 WinDirStat helps you get a complete overview of the contents of a drive. It not only visually represents the content, but also shows the location in a Windows Explorer like tree view and the extensions and file types present in that drive. That is a lot of information, that can really help you in moving and organizing data. WinDirStat is a small freeware utility, which rapidly analyzes data from the drives you select at the start and present you with the information. The image above shows the analysis I ran on 3 drives on my computer. The top left pane shows the drives in a Tree View like Windows explorer, so that you dig deeper in any folder to see the content – edit, delete or move them to manage space more efficiently. The top right pane shows the file types in a particular drive and the bottom pane represents the space occupied by a specific file type. You can easily select any data chunk and right click on it to find its exact location and which file type is it. With these features managing data become very easy. You can easily always find that obscure big chunk of data, that is hogging a lot of space and either move it to portable drive or remove it to generate free space. The Toolbar at the top gives you a few shortcuts to perform operations faster. Open – You can open a new hard drive to inspect. Refresh – Refresh selection to see the effect of the changes made. Open - Open the selected item. Copy Path – Copy the path of the selected location. Explorer – Explore at the selected location,opens the Windows Explorer. Open Command prompt – Opens the command prompt window. Refresh Selected – Refresh the selected location. Delete Forever – data bypasses the recycle bin, cant be recovered, use carefully. Properties – Shows properties of selected item. And the last three are Zoom In – Zoom Out and Help. 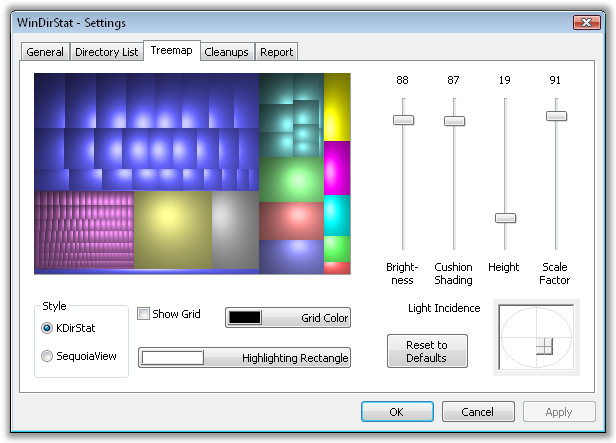 WinDirStat gives you a few options to configure it to your liking. If you do not like the visual representation, you can always make changes to it via the options tab. 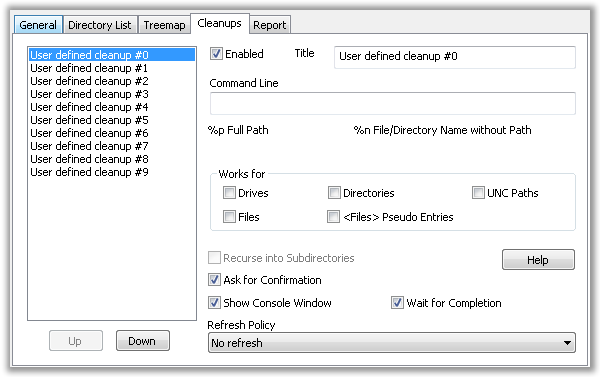 You also have an option to run custom cleanups via the command prompt. This is aimed at advanced users, use it if you are comfortable with command prompt. Overall, a very handy utility for managing disk space.Visual representation really speeds up the process of managing data. There are a few others about which I would write in future, but this one is the first one to go for always. Do you use any other software for data management on your computer? What do you think about WinDirStat? Let us know your opinion in the comments section. Next articleWhat is Google’s PubSubHubbub and How does it work?